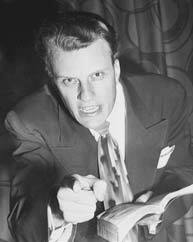 Billy Graham: "I have regretted that I have not spent more time in prayer [and] Bible study"
"I’ve been concerned about our nation, our world and the political processes, but also I have regretted that I have not spent more time in prayer, in Bible study and in the pastoral ministry that pas­tors are usually called to do. An evangelist is a little differ­ent. The word evangelist "the spreader of good news," and my job, it seems to me, has been to go all over the world and proclaim that good news, and that’s my primary mission. But I did learn a great deal in my travels about our world, and I became con­cerned about it, and I spoke about some issues in that peri­od of time. To a young man today, I would say: 'Put your emphasis on your Bible study and prayer.'" Let us respond by taking Dr. Graham's advice. Why wouldn't we? Prayer is communion with God. And the Bible is where we find out exactly what God wants us to do. What more could we want? Let us pray and obey. The rest will follow.